Stunning 4 bedroom 2 bath split floorplan home is located on a quiet cul-de-sac in Wesley Chapel’s Oak Creek Community. Private setting with mature groomed landscaping. The screened lanai is a peaceful escape after a busy day overlooking a wooded conservation area. Walk a few feet to a soothing sparkling blue pond that boasts a walking path and large shade trees to relax under. This beautifully decorated home features, plantation shutters, lots of natural light, vaulted ceilings, formal dining room, living room, open floor plan with breakfast bar island, eat-in dinette and family room. The gorgeous kitchen features 42” cabinets, beautiful granite counters, stand-alone island, large pantry and a communication/desk area. The spacious master suite host vaulted ceilings, enhanced walk-in closet, master bath with garden tub, separate shower, water closet and dual vanities. The split layout offers privacy for the master suitevfrom the other bedrooms. Separate laundry room, plenty of closet space and roomy garage. CDD fees are included in the tax bill. Oak Creek has many amenities for its residents, including a community pool, cabana, grilling areas, dog park, covered playground, swings, & basketball net. 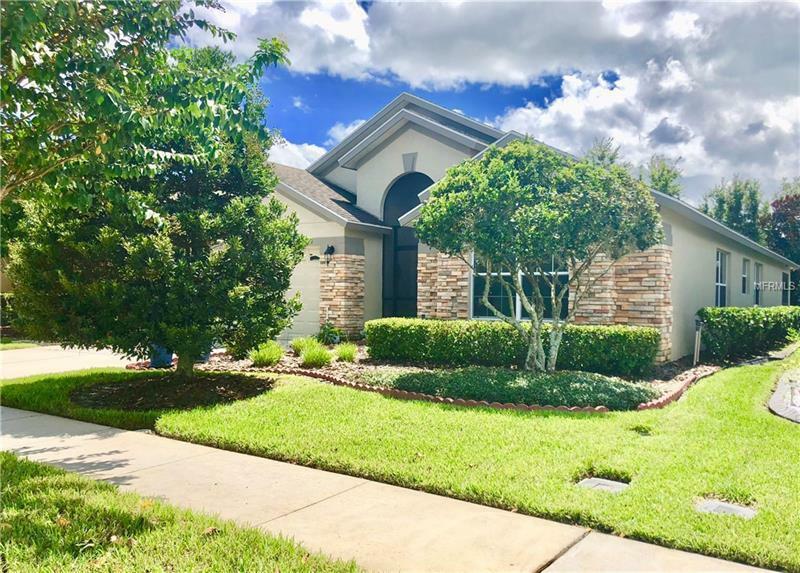 This home is conveniently located in a popular area of Wesley Chapel, close to I-75 and in close proximity to shopping, restaurants, entertainment, schools, colleges, & hospitals in Wesley Chapel, Zephyrhills, & Dade City. This is a MUST-SEE home that won't last long!